Activism Now! is Dazed staff writer Karen Orton’s monthly profile of the activists, global citizens and civil disobedients fighting for a better world. For a growing number of activists, the Arctic is the frontline for global warming. The true magnitude of climate change’s impact hit home this year, with the unprecedented melting of the Arctic sea ice, which hit a record low in September. A shocking 97% was melting at one point – faster then any scientific models have predicted. It’s pointing to the possibility of an ice free Arctic by 2020, and Garman points out, rather bleakly, “if the sea ice disappears, some scientists say that it’s in a ‘death spiral’ – which means it will never recover.” Now that the Arctic’s vast oil and gas fields (estimated to contain more than 20 per cent of the world’s reserves) are increasingly within reach because of retreating ice, corporations and governments are clambering to stake a claim. A global outcry greeted Shell’s exploratory oil expedition in Alaskan waters this autumn, Maggie James was one of the young activists who took part in the Climate Justice Collective’s protest. The group blockaded the entrance to Shell’s London headquarters by building an igloo made from giant blocks of ice. “We wanted to bring home both the unsung tragedy of the collapse of the ice sheet, but also make clear that there are companies who bear a lot of the responsibility for climate change, and that the same companies, especially Shell, are set to profit from drilling in the Arctic,” James explains. While Shell’s initial attempt this year was thwarted by a giant marauding iceberg, the energy company plans to go ahead with Arctic drilling next summer. A few campaigners are not taking this lying down. Greenpeace’s protest actions over the last year shut down oil-rigs, ships and icebreakers while landing a number of activists in jail. Protesters recently boarded and locked themselves to the mast of a Shell icebreaker in Finland that was headed for the Arctic, while off the coast of Greenland, activists sped past Danish commandos to scale oil rigs where they prevented drilling by dangling inside the rig in tents which were hung by ropes. 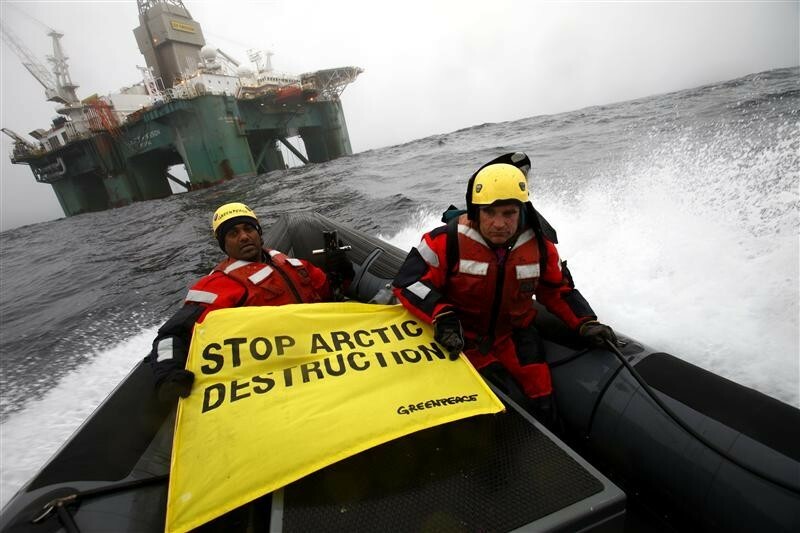 Activists also boarded a Shell drilling ship and stopped it from leaving New Zealand for the Arctic, while in the waters off northern Russia, several protestors in inflatable boats tried to prevent Gazprom staff from reaching a drilling platform, ending up in the freezing sea when their boats were overturned by oil rig workers. Last year Kumi Naidoo, the global head of Greenpeace, scaled the ladder of an Arctic oil rig while being blasted by freezing water cannons – he made it to the top only to be immediately arrested. You can’t say they’re not dedicated.